The dormouse is a priority species in the UK Biodiversity Programme and a national species action plan has been written. Dormice have statutory protection nationally and in Europe.A number of key elements have been initiated for the Dormouse BAP. 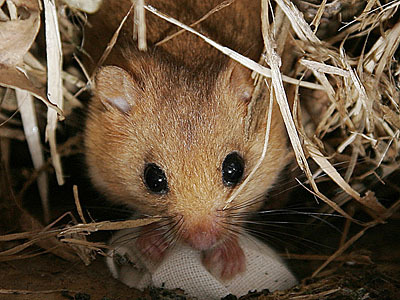 The first nationwide monitoring scheme for any British mammal was set up 10 years ago and now a comprehensive database contains annual data on the dormouse population throughout the UK. Reintroductions of captive-bred animals to counties from which they have been lost have been carried out at 14 sites, throughout 11 counties. The next stage will be to revisit these sites with a view to improving the surrounding habitat and linking these woodlands to other suitable habitat, particularly through hedgerow corridors.Other ongoing elements of the dormouse BAP are to encourage suitable land management, improve habitat and increase public awareness with regards to this endangered species. As a consequence of the BAP’s and SAP’s there are a range of projects thant have been undertaken to conserve dormice. The Derbyshire Dormouse Project organised by the Derbyshire Mammal Group provides details of progress at the two reintroduction sites in the county. Bath & North East Somerset and South Gloucestershire ran a three year project called Dormice on your Doorstep to involve people in local wildlife and natural heritage. The North Wales Dormouse Project aims to give us a better understanding of where Hazel Dormice (Muscardinus arvellinarius) can be found across North Wales as well as increase awareness of dormice and the issues that affect them. The Vale of Glamorgan South Wales dormouse survey is a joint project between 14 local authorities in south Wales, Gwent Wildlife Trust, the Wildlife Trust of South and West Wales and the Countryside Council for Wales. Warwickshire have a local dormouse group with the aims of supporting the objectives and targets of the Common Dormouse Action Plan. Surrey Dormouse Group is a group of volunteer conservationists dedicated to improving the conservation status of the Hazel or Common Dormouse within Surrey. In 2008 the SDG used an infra-red black and white camera to record footage of wild Dormice using a nest box. There is also a very nice site on the Continent at www.hazelmuis.be, unfortunately it’s in German.